Here is a new painting that's just been hung right in the front hall of the Mount, near the switchboard, outside of chapel. 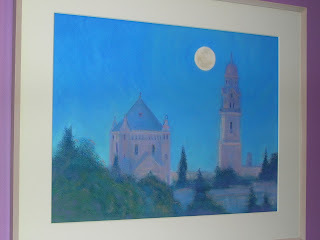 The title is, "Full Moon Over Dormition Abbey." The artist is Jim Schantz. It was a donation to the community by Bernie and Sue Pucker, longtime supporters of Brother Thomas. Their gallery in Boston is the primary source of his work. Dormition Abbey still exists today--in Jerusalem--with a Benedictine community of 15-20 monks. And in a completely different vein: even if statistics are not among your favorite things, I think you'll enjoy this website that a friend sent me this week. It's quite an amazing look at our planet, its people and situations. World Clock.